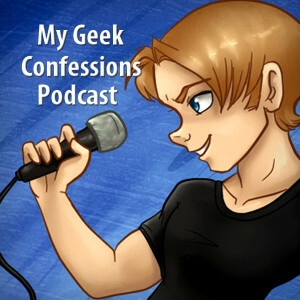 Welcome to our third delayed episode from A-Kon 27 in Dallas, Texas! We’ve actually known Morgan for a little while since we’ve been able to see her frequently at various events and conventions here in the Dallas Metro area, but never had the chance to interview her. So we were really excited to finally get a chance to sit down with her! Morgan Berry is a relatively new voice actor but has accomplished a lot in a short amount of time! 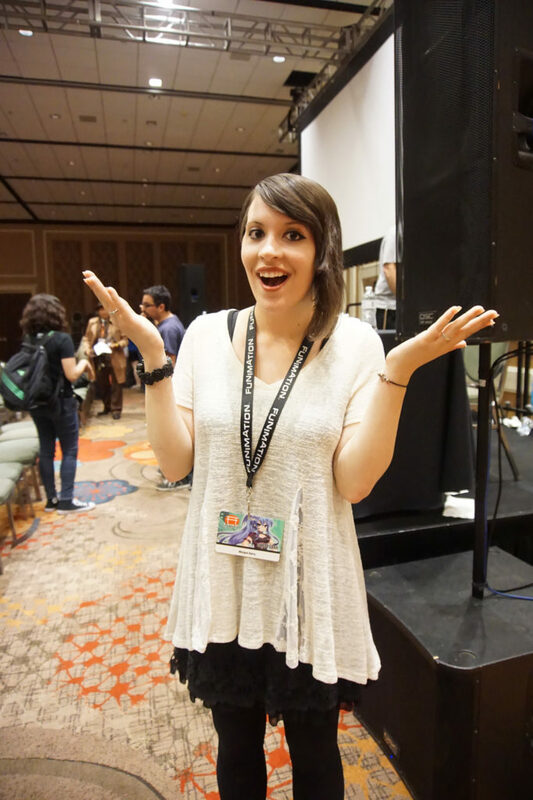 She got her break into voice acting by winning a voice acting competition at “Haber-Kon” (a convention thrown by voice actor Todd Haberkorn) which gave her an audition at Funimation and the rest is history. Since then Morgan has been very busy! She’s Tokaku Azuma in Riddle Story of the Devil, young Ichirohiko in The Boy and The Beast (where she did VERY good) , Linda in Hyperdimension Neptunia (co-starring with David Vincent), plus parts in several Broadcast Dubs like Show by Rock! !, My Hero Academia, and many others. She’s also going to be playing the villain in the upcoming game, Forbidden Planet 2. Not only that, but Morgan also has her own Youtube channel where she sings covers of anime songs as well as original material under the username “AnUnknownSongBird”. If you’d like to find Morgan Berry on the web, you have plenty of places to do so. You can like her official Facebook page and follow her on Twitter, subscribe to her YouTube page, and even on Tumblr! MyGeekConfessions: Alright, we’re here with our next guest! I’ll let you introduce yourself. Morgan Berry: Hi, guys! My name is Morgan Berry. I play Tokaku Azuma in Riddle Story of Devil, Linda in HyperDimension Neptunia, and young Ichirohiko in The Boy and the Beast. MGC: Yes, and you’ve been in a lot of the movies and stuff lately, too. You’ve been really busy! So, we already kinda know each other, but for those listeners, we wanted to start with our generic question of: How did you get your start? In this case, we know you do both voice-acting and, like, your youtube, and singing, and everything like that. So we wanted to kinda cover all of the bases there. MB: Awesome! Well, how I got started into voice-acting… I’ve always loved anime, and I’ve always loved acting. And, at one point, I was doing more singing than I was acting, and I thought, “You know what, I really want to get back into acting.” And I just happened to be on Facebook, and Todd Haberkorn had posted that he was having a convention called “Haberkon”! MB: Yes, and I kept reading. I was like, “Ooh, I wanna go to this!” And then, I read that there was going to be a voice-acting competition. And I was like, “Okay, cool!” Oh yeah, I realized that’s a thing, voice-acting. Like, I love acting. I could do this! You know, because I was so involved with theater all throughout high school and middle school, and it’s something I love, so I was like, “You know what? That’s cool, I’m gonna try this.” And then I read further, and it said that if you win this voice-acting competition, you’ll win an audition at Funimation. MGC: Well, that’s like a prize right there. MB: Right? So I thought, “Wow, this could be it.” And then I was like, “Alright, Lord, if this is what you want me to do with my life, then I will win this competition. Let’s see what happens.” And, so I participated, and I won! MGC: And the rest is history at that point? MB: Yes, and the rest is history! MGC: So what was- Do you mind if I ask, what your first audition was, or was it just kind of a generic one? MB: Yes! I was for A Certain Magical Index movie. MB: For that specific audition, I didn’t get in that movie, but- ‘cuz there’s a show, and then there’s a movie leading up to it. MB: And so I didn’t get into that, but then shortly after, they called me in for Fairy Tail, and so I did lines in Fairy Tail, and then shortly after that, I got my first named role in HyperDimension Neptunia as Linda. MGC: With David Vincent, actually. MB: Yes! I love David Vincent, he’s great. MGC: Because we just interviewed him, too. MGC: So, did they have you do, like, walla and stuff at first, as well? MB: Yes, basically it all starts with Walla. You have to… Yep, it all starts with walla! MGC: Okay! And so, let’s go back. You talked about your voice-acting. What about all your singing, and your career on that side of things? How’d you kinda get your start there? Yes, singing, because I know you have your YouTube page, and you’ve done a lot of those other things, as well. MB: Yes. I love singing. I’ve been singing ever since I was a kid. And, a few years ago, I thought to myself, “You know what? I wanna find this one song in English.” It was the opening to Attack on Titan. MGC: Fits the beat and everything, gotcha. MB: Yes, gotta hit the beat. It’s gotta hit every syllable. Yeah, it’s gotta hit every syllable, ‘cuz I want it to be genuine. MGC: And, how difficult is that, to be able to adapt the words, the rhythm, and everything like that? MB: It’s so hard. Because I’m so picky, and I want it to be perfect. And, there are some words that just don’t work in a song. It may be the right amount of syllables, but it just doesn’t sound right, because it doesn’t flow off the tongue right, and so I can’t use it, and so I have to find other words. It’s pretty difficult. It takes me days – a long time to get it right. MGC: Wow, really. Okay. Well, you kinda mentioned a little bit, but have you always wanted to sing and to voice-act? Is that always been a kind of a goal, or is it something you just kinda fell into? MGC: Was that the same with the singing, as well? Or is it, like you said, you just kinda like, “Oh, I’ll do this cover,” and then kinda just exploded from there? MB: Well, I used to be a part of a band. And so, we traveled all over America, singing and dancing. And, it was an all-girl pop rock band. MB: Yeah, it was a lot of fun, and so I did that for years. My first solo was at Bass Hall when I was 14, and.. Yeah, I guess it kinda started from there, because I loved singing when I was little, but I didn’t take it seriously until I was 14. And, I started taking lessons, then I sang my first big solo, and then I joined the band. MGC: Is that something you always have thought about as part of your career, as well, or is it just still kinda-? MB: I would hope. I mean, I wrote a song called “Fearless,” and it’s on iTunes right now. It’s the only song I have on iTunes right now, but I’m hoping to- I love writing songs, and I’m hoping to eventually get all of them out there. MGC: But as far as both coming up with one, and then, you know, if it’s something that you’re having to repeat over and over again with multiple sessions, how do you get back in character? MB: Well, for some cases, I’ll come in not knowing what I’m recording for. They just have me on the schedule, and they’re like, “Hey, can you come in for this?” Like, at this time, they don’t even tell me what show, what character. And, so I’m like, “Yeah, I can come in.” And so, I come in, and that’s when I find out what I’m voicing for. And, the director will tell me what’s going on in the scene, and then I’ll do it, and it’s just so quickly. But, when it comes to.. like, that’s just when I’m given a role, and I don’t even audition for it. But, when I audition for a role, they have the sides, they explain the character’s background, and how the character’s supposed to sound. And, I look through that, and I look at the character’s picture, and I try to get a feel for how this character’s gonna sound. And, you know, I try to put myself in their shoes, because it’s acting, and so that’s how I get into character. MGC: Okay. Do you ever have to, like, if you’re doing it in multiple days, you ever have, like, have a vocal reference, or do you pretty much already have it down by that point? MB: Sometimes, I have to listen to a recording of myself. And, the directors will sometimes play a recording of the actor. If it’s been a few weeks since we’ve recorded for the character, they’ll say, “Alright, here’s a reference,” and they’ll play the last line you read for last time you had a session, so you can get back in the character. MGC: Gotcha. Well, and you kinda described that a little bit, as far as when you first did your first song, and it takes a few days, but what is your process of being able to do a video for your singing? You know, do you do warm-ups, do you do what other things you look for in your adaptations, and being able to post this stuff on YouTube? MB: I drink a lot of water before I record, because, especially with voice-acting, you don’t wanna have those clicks in your voice when you’re talking through the mic, ‘cuz then they have to edit those out, and that takes a while. So, you don’t wanna give them more work than they have to do, so drink lots of water before you record – whether it’s voice-acting or singing, and sometimes I do vocal warm-ups whenever I get the chance. MGC: And, ones we always like to kinda end with, as well, is do you have an advice for people who’re trying to do this for a career, either, again, for YouTube, for singing, or for, you know, doing voice-acting, or anything like that – for people who’re starting out, people who’ve been doing it for a while, or who’re trying to just kinda put their feelers out there. What kind of advice would you give? MB: Definitely, when it comes to voice-acting, take acting lessons and acting workshops, and it’s something you can even google. You can find classes in your area, and just to hone your acting skills. And, you can get involved in your local theater – or if you’re in a public high school or middle school, you can get involved in the theater department. And, just, get as much experience as you can, and build your acting resume. MGC: Okay. Anything else as far as- I’m assuming that’s kinda the same as far as for singing, to just take classes, and practice, and things like that. MB: Yeah, I was a part of a choir for nine years. MB: Yeah, and that’s including me being a part of the band, so I did all of that for a super long time. MGC: It definitely sounds like it. And, our last question we always like to end on is, what general life advice do you like to give out? If you’re trying to give advice for somebody to live a good life, what kinda things would you say? MB: Be kind to others. Don’t be a diva. You know, everyone’s going through something. And so, take the time to encourage someone – even someone random on the street. You don’t know them? Take the time to give them a compliment, because you never know what they’re going through, and a simple compliment could bring a smile to their face, it could make their day, it could make their life. You could save them, so take the chance to encourage people. MGC: Okay, that’s very nice. And, just lastly, is there anything coming – we know there’s NDAs (Non-Disclosure Agreements) and everything all the time – is there anything coming up that you’d like to pimp out, or is there- want people to reach out through social media or anything? Feel free to take the floor and pimp out whatever you would like. MB: Awesome! Well, Freedom Planet 2, it’s a video game that’s gonna be coming out next year. I’m playing the lead villain. I play Merga. And, a lot of great people are gonna be in it. There’s Christopher Sabat, Sarah Ann Williams, Lindsay Jones, Josh Grelle, a lot of great people are in it. It’s gonna be fun, and, yeah, that’s something to look forward to! And, as far as social media, I’m on Twitter @TheMorganBerry, and I’m also on Instagram with that same name, and I’m on YouTube as AnUnknownSongbird. MGC: Okay, well we’ll make sure that we link to all those things for everybody to check out, and we’ll follow you as well once this goes live, and thank you again! I know it’s been a long time coming, but we appreciate you finally sitting down with us and letting us ask these questions of you.